Starring Paul McGann! The Eighth Doctor battles for survival in the Time War in this special run of prequels to Doctor Who: The War Doctor! 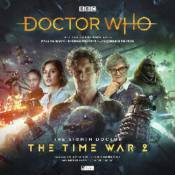 2.1 The Lords of Terror (by Jonathan Morris)-When the Doctor takes Bliss to her home colony, they discover that the Time War has got there first. Bliss finds her world altered beyond recognition, and the population working to serve new masters. 2.2 Planet of the Ogrons (by Guy Adams)-Avoiding the Time War, the Doctor and Bliss are found by an old acquaintance: the latest incarnation of a criminal mastermind the Doctor knows of old. But unlike her predecessors, the Twelve has a handle on her previous selves' unruly minds. There is a mystery to solve involving the Doctor's TARDIS and its unusual occupant - and answers will be found on the Planet of the Ogrons. 2.3 In the Garden of Death (by Guy Adams)-In a prison camp like no other, the Most Dangerous Man in the Universe is held in isolation. The rest of the inmates have no memory of who they were or what they might have done. No memory even of their captors. Until the interrogations begin. Cast: Paul McGann (The Doctor), Rakhee Thakrar (Bliss), Nicholas Briggs (The Daleks), Jacqueline Pearce (Cardinal Ollistra), Julia McKenzie (The Twelve), Nikki Amuka-Bird (Tamasan), Amanda Root (Lendek), Rakie Ayola (Pollia / Lambda Epsilon), Guy Adams (Rendo), Simon Slater (Carvil / Shaler), Jon Culshaw (Doctor Ogron), Victor McGuire (Borton), Anya Chalotra (Ensign Murti), Tania Rodrigues (Chief Panath), Surinder Duhra (Executive Officer Omor).